Since we’re hopefully, wrapping up a lot of the work on the house next week, I’m trying to work on some window treatments around the house before this baby boy makes his appearance. One of the reasons I waited this long was because a lot of the windowsills need to be sanded, and I didn’t want to risk new window treatments getting covered in dust. That, and I’m always paralyzed by big decor decisions. Also, the lots on both sides of us are finally getting houses (our closest neighbors have been 4 lots away), so it’s probably time to start living more privately. One of the rooms at the top of my tackle list is Owen’s playroom. It has two walls with a trio of windows on each wall. One set faces south and the other faces west. So this room gets tons of light throughout the day. 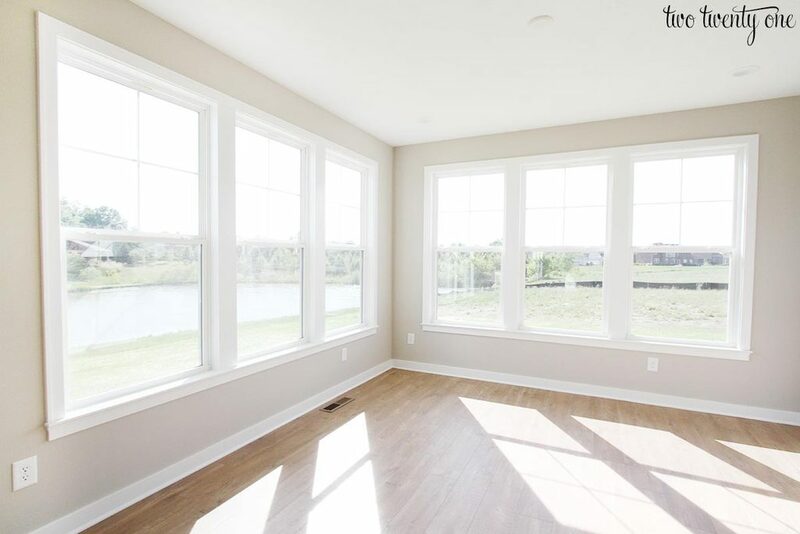 Right now I’m debating between 2″ white faux wood blinds and top down bottom up white cellular shades. 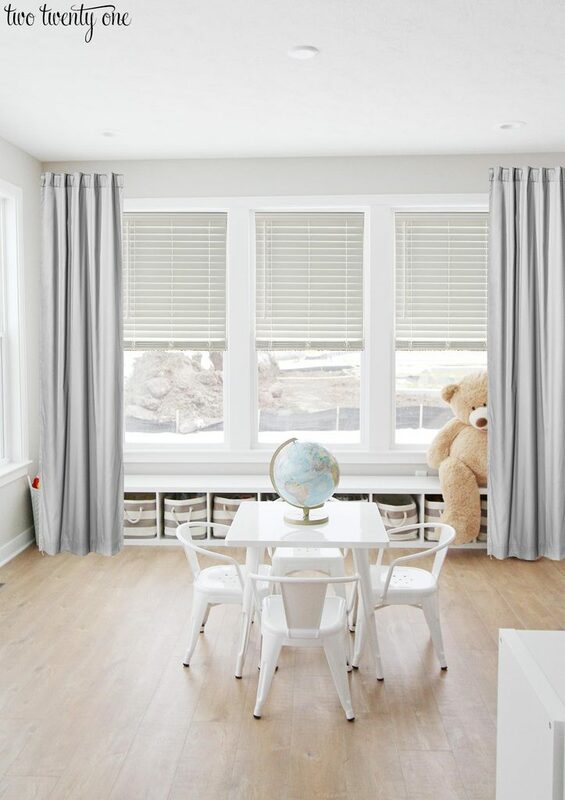 I don’t know what I’ll do about curtains yet, but I added gray curtains to the Photoshopped images so the windows don’t look completely sad and bare. I did the mock up images only using the west-facing windows because the drywall guys were working in the playroom yesterday so I couldn’t get a photo of the south-facing windows. With the 2″ faux wood blinds, I have the option of tipping the blinds up or down to direct the light. And I can obviously lift them up if we want more light to come into the room. The faux wood blinds have more of a classic, traditional look to them. With the top down bottom up cellular shades, I have the option to move the top of the blinds down to let more light in, while still maintaining privacy. I can also lift the bottom of the shades up as well to let in more light or to be able to see outside. The cellular shades have more of a modern, clean look to them. So, what do you think? Weigh in below by choosing your favorite option. I like both options but I think the top down bottom up would be nice so you can get more light. Good luck, this is a tough one! Do the cellular shades. I have them in my home. They give lots of privacy but let light in and block out heat. We previously had the faux wood blinds and they got very dusty and made the room so dark. They look nice but I think cellular are more practical. Also, my cellular shades do not have cords. They have a button you push in the middle to raise and lower. Just a safety item if it’s a playroom. I have the faux wood blinds and when you pull them up they get so heavy. I have the cellular shades on all bedroom windows and I love them. JCPenny’s has great deals on cellular. That space is naturally bright and maximizing light in that room would be the best with a light filtering cellular. Good luck! Can’t wait to see the finished product. I think in the long run you’ll be more happy with the cellular shades. The convenience of top down, bottom up and the energy efficiency of keeping the room cool in the summer and warm in the winter are pluses. They’re lighter when pushing up and pulling down vs. faux wood and don’t show dust as easily. Cordless is also a huge plus although faux wood also come with that option I believe. We used Lowe’s for 12 windows in our house (install too) and were happy with the price, quality, and service. Not sure I like the long curtains, I can see the boys playing with these. Getting dirty with little finger prints, etc. I would go with something that doe not touch the floor. We had top up/bottom down wood blindes in our bedroom before we moved and I absolutely loved them! It was so nice to allow light in and still give us privacy as well. Can’t wait to see what you decide. I like the white faux blinds best of those two options. We got all of ours at Lowe’s and used their Style Selections brand. Super nice and very affordable. With that said, what about Roman shades?? Love the idea of allowing light in while maintaining privacy. If you go with the cellulars, please link the ones you choose and let us know what you think! So many options. We have white cellulars like those that make the room feel so soft and light but are also insulating and private. I think 2” horizontal blinds with a valance hung with ring clips. Ring clips are easy. You can pinch a pleat and clip it. A plan rectangular valance looks custom made with the little pleats. Valance would add a pop of color too. We have white faux wood throughout the house and love the look. But, I WISH I had known about the cordless option before we bought last year. The cords – ugh. Otherwise, love the look. We ordered from Steve’s Blinds – they replace any that don’t fit or break within a certain time frame. Loved them! I like The faux wood blinds!! I would not do drapes at all- they look nice but collect dust and if your little one has allergies to dust like mine do it’s no bueno!! Not to mention they attract little ones to tug on them wrap themselves around in them and then the constant taking down to wash them and rehang would maybe get old after a few months… have fun choosing what works for you and your little one!! ? 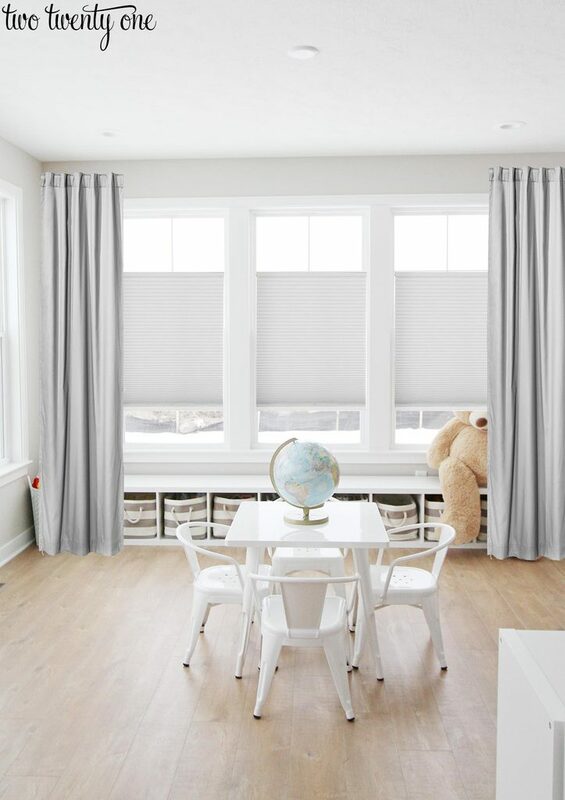 I voted for the 2″ blinds, although I like the look of the cellulars better BUT with two little boys who will be constantly looking out the windows, I was thinking the 2″ blinds would be easier to keep clean. What about woven bamboo, with the same up/bottom mechanism as the cellular shades. We have both woven shades and cellular shades. I prefer the woven shades, they give a warmer look, plus can see through them while blocking sun/privacy. I have both in my house in different rooms. I have the two inch faux wood blinds in my family room (north and east facing windows) and the top down bottom up shades in the bedrooms ( south and west facing windows). I went with room darkening in the bedrooms and I love them. I would probably do the faux wood blinds in the playroom though as I feel like they would hold up better with little boys playing in the room. Congratulations on the addition of Emmett to your family. Have to love those little boys – I had three! Question- where did you get that low storage bench?? I am decorating a playroom with a very similar layout and am going nuts trying to find storage that doesn’t block the windows! I vote solar shades, but you probably already decided at this point.